River Ave. Blues » Game 146: Good Sevy or Bad Sevy? The nine-game winning streak against the Twins came to an end last night and tonight the Yankees will try to avoid doing something they’ve only done once in the last four years: Lose a series to the Twins. The Yankees dropped two of three to the Twins last July. Before that, you have to go back to late-May/early-June 2014 for their last series loss to Minnesota. Warm with clear skies in Minneapolis tonight. First pitch is scheduled for 8:10pm ET and YES will have the broadcast. Enjoy the ballgame. 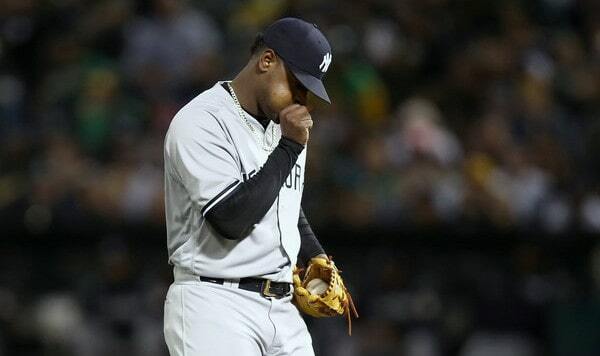 Injury Update: Aroldis Chapman (knee) threw a bullpen session in Tampa today. Depending how the knee responds, he could rejoin the team “sometime next week.” Hooray for that … Aaron Judge (wrist) took regular on-field batting practice with the team today rather than early work by himself. It doesn’t sound like much of a difference (and it’s really not), but it’s a sign he’s inching closer and closer to normal game preparation … Brett Gardner is out of the lineup for a second straight day with a sore right knee. He hurt it making a catch Monday. Roster Move: Welcome back, Chance Adams. The Yankees called him up from Triple-A Scranton today, the team announced. There are 33 players on the active roster now. Luis Cessa, Sonny Gray, and Jonathan Loaisiga all pitched the last two days, so Adams is the long man du jour.